Choosing the right lift chair can seem a little bit overwhelming at first, especially when you start looking at all the different models that are available. However, there are actually not as many options as it seems, as usually most lift chair manufactures take one model of lift chair and then add features to it to create their complete line. This is a guide to the different lift chairs offered by Pride and Golden, which will help the average consumer understand the similarities and differences between the different lift chairs offered. Make sure that you check out the ” Putting it in Perspective” section of each review, as this helps to categorize the different lift recliners. 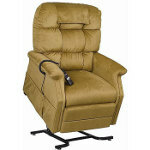 Hopefully, this lift chair review section will help make selecting the right lift chair much easier. If you have any questions or if there is a lift chair that you would like reviewed, please do not hesitate to leave a comment or contact us. If you have any questions or if there is a lift chair that you would like reviewed, please do not hesitate to leave a comment or contact us. Also, if you own one of the lift chairs and would like to share your thoughts and experiences, please do not hesitate to drop us a line.